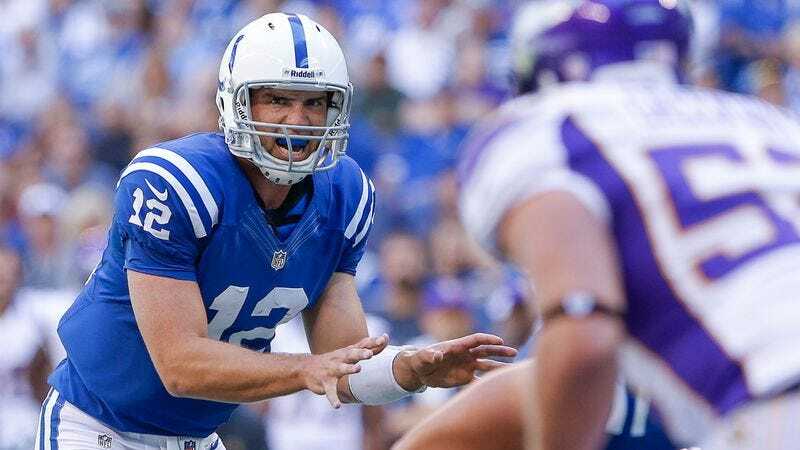 INDIANAPOLIS—Rookie quarterback Andrew Luck helped the Colts outscore their opponents 23-20 on Sunday to earn his first whatever that thing is called when you beat the Minnesota Vikings. “It’s great that Andrew has his first one of those things you get for defeating the Vikings under his belt,” said Colts head coach Chuck Pagano, who called Luck’s achievement a “victory-esque result.” “I mean, he’s still waiting for his first win, but he’s young. Just got to take it one step at a time. The important thing is that he went into the game and tried to get that, whatever it is.” According to Pagano, Luck’s performance was even more impressive the previous week, when the quarterback managed to lose by only 20 points while playing for the Indianapolis Colts.